AOL's Beta version of AOL Uncut went live today (via Techcrunch). AOL UnCut is powered by (First Round Capital portfolio company) VideoEgg. Congratulations to the Videoegg team for such an elegant integration. VideoEgg is powering the video hosting/streaming for dozens of other websites, including Bebo. Rather than create yet another video destination site, VideoEgg lets any website owner integrate video into their site for free – providing the hosting, transcoding, editing seamlessly (try it out at http://www.videoegg.com/affiliate/). I continue to believe that the online video game will be won by a company that works with existing destination sites rather than building competitive new destinations. Time will tell.. I just read the rumors about Jotspot being acquired. While I have no information as to the accuracy of the report, I wish for the best for Joe Kraus and team. 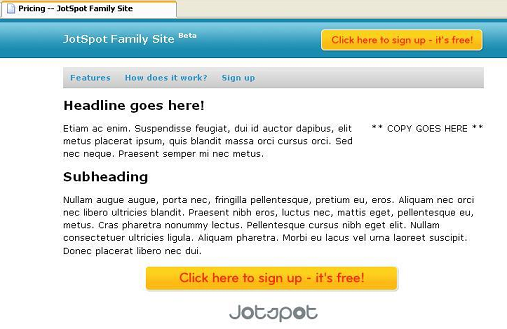 Recently, I've been playing around with their new JotSpot Family Site that launched last week. I think Jotspot has been doing a great job of building specialized applications on top of a wiki framework. (Their tracker application is very slick). One of the few benefits to being a technology investor based outside of Silicon Valley is that I don’t spend all my time in the valley. While I'm out in California every few weeks, I get to spend most of my time in the "real world." Over the last several weeks, I’ve been on several phone pitches from west-coast companies that are looking to be the “flickr of XXXX” or “like del.icio.us but YYYY” or “the Digg killer”. It got me thinking – how many people outside of the valley have ever heard of these companies? I asked a bunch of local (Philly-area) acquaintances and the answer came back loud and clear: none – nada - zip. People here have barely heard of Myspace and Craigslist – let alone any of the “hot” Web 2.0 companies. A good review in Techcrunch can get a company their first 5-25K beta users very quickly. However, I’d strongly caution entrepreneurs from taking their initial consumer adoption metrics and extrapolating them too far into the future. I believe startups will find it difficult to cross the “Techcrunch chasm” between the Web 2.0 geeks and Mainstreet USA. If we could get access to the usage logs of the top 10 Web 2.0 properties, I would bet that their 10,000 most active users would all be the same. As I evaluate new startups these days I’m finding it harder and harder to see the big ideas that will appeal to a large, non-geek consumer audience. Thoughts?